Kaaba is Islam's most sacred location and pilgrimage (Hajj) shrine. Kaaba is located in the courtyard of the Great Mosque of Makkah. According to the Quran, the cubic-shaped structure was built by Abraham and Ishmael. A trough in which they mixed mortar stands near the door and is a popular place of prayer. The Kaaba houses the Black Stone which is one of the most sacrad object for Muslims. The Black stone (hajar-e-Aswad) is thought to have been given to Ishmael by the angel Gabriel. When Muhammad began to preach Islam in Makkah, the Kaaba was a shrine for the pagan deities of the Arabs. The Kaaba was rededicated to Allah after the Prophet Mohammad (PBUH) established control of Makkah. All Muslims face toward the Kaaba during their five daily prayers. Welcome to Kaaba, the holiest place for Muslims in the world. Kaaba, also called K'abah is situated in Makkah, Saudi Arabia. Muslims all over the world pray five times a day facing towards Kaaba. 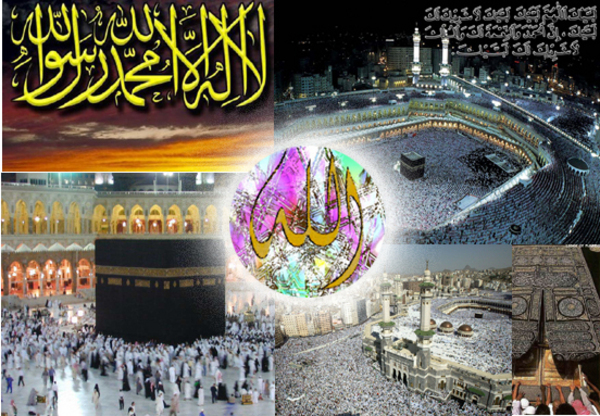 Hajj is the one of the five basic pillers of Islam and Muslims who can afford come to Kaaba, for Hajj once a year. The Quran commands the Muslims to face the Kaaba in Makkah during prayer which is a fundamental tenet in slam. The legend of this purely Islamic development of a sacred stone structure dates back to the fall of Prophet Adam from Paradise onto earth at Makkah. It has been reported that Angel Gabriel flapped his wings to uncover a foundation laid in the seventh fold of the earth. Angels paved this foundation with stones and Adam went round this structure following the example of the Angels. Therefore it stands to reason that Allah contemplated and designated the Kaaba before the creation of the earth. The Kaaba with respect to the inhabited parts of the world is like the centre of a circle with respect to the circle itself. All regions face the Kaaba, surrounding it as a circle surrounds its centre; and each region faces a particular part of the Kaaba. Prophet Muhammad (PBUH) adopted the Kaaba as a physical focus in prayer as well for other acts of worship such as burial of the dead, recitation of the Quran, announcing the call of prayer, the ritual slaughter of animals, etc. Thus, Muslims have been spiritually and physically oriented towards the Kaaba and the holy city of Makkah in their daily lives. In Kaaba picture gallery on this page you will find a number of Kaaba pictures. If you have any Kaaba picture which you will like me to add to Kaaba image gallery, please send me that Kaaba picture or Kaaba picture URL. I will be personaly thankful for such Kaaba pictures. #1 Trick to Weight Loss Canadian Mom Lost 46lbs of Body Fat In 3 Months Using 1 Secret Formula! Please visit the site at Kaaba if you would like to see the asset profile as currently you cannot go to asset profile from the community page of the asset/celebrity profile. How to find Qibla (kaaba) direction? Does anybody has kaaba pictures? If anybody has kaaba pictures and would like to share with others, kindly send me those pictures and I will post those here. Where is the Black stone in Maaka?